Click on the big orange “RSVP Now” link in the members invitation you will have been emailed. Then log into your MP account (if your PC doesn’t automatically log you in)which will take you to the below entry form. Click “YES” to indicate you will be attending then scroll to the foot of the page to start to register your boat entry by clicking the ticket purchase option “Your First Boat”. This will then take you to the info screen where you need to complete the relevant fields and then select the number of boats you wish to enter by clicking on the items marked in red circles. Take care that correct number of boats from the checkboxes is reflected in the dropdown payment options. When you click on the “Continue” button, you will be taken to our payment processor PayPal. 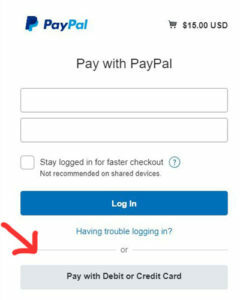 You can make payment for your entry by card even if you do not have a PayPal account by clicking as shown below. We recoomend that you open a Paypal account however as you are automatically entered into the buyer protection programme. Alternatively, on a PC or tablet, log into your MP account at memberplanet.com, then go to your member portal and select the events tab from the menu on the left, then click on the event of your choice which will take you to the same entry form as above. Alternatively you can use the Memberplanet smartphone app to register. Log into the app and go to the OMRA group page then simply click on the “Events” tab. Scroll through the events options and hit the RSVP link at the bottom of the eventpage. This will take you to the same booking form as above in section 2 where you simply need to RSVP and then scroll down to buy your tickets.